The Arctic Sea’s epic has taken another turn, having apparently left the Canary Islands. However, the new whereabouts of the vessel and an accompanying Russian warship are still not known. "The cargo vessel and the warship disappeared from our radars, which cover an area with a radius of 25-30 nautical miles." The controversial vessel Arctic Sea couldn't enter the Spanish port of Las Palmas on Wednesday because it has military on board, Interfax reports, referencing the owner of the vessel, Solchart. 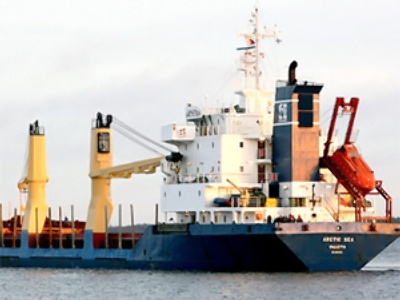 “A commercial vessel which has members of the armed forces on board has military status, and as a result, that requires totally different conditions for its entry to a foreign port, primarily, a consent between both countries’ foreign ministries,” the company's chief Viktor Matveyev said in a statement posted on the company's website. However, according to an Interfax source in Russian law enforcement bodies, the Arctic Sea has been denied access to the port because it has not paid the necessary fees to the Spanish maritime authorities. “The fact that the military are on board plays no role in this case. A vessel is only considered as having a military status if it carries the flag of a certain country,” the source told the agency. It also noted that the Russian military are on board to help the crew and, if necessary, can move to the Ladny vessel, which is accompanying the Arctic Sea. The owner of the ship says on September 14, his company received a letter from the Russian Investigative Committee. In the letter, it asked them to send the crew to Las Palmas and ensure the handover of the ship. The company claims it sent the letter to the Investigative Committee on September 14, but has not yet received any reply. The Arctic Sea was seized by alleged pirates on July 24 in the Baltic Sea, and was found almost a month later by the Ladny frigate off the Cape Verde Islands. There has been a lot of speculation about the cargo on board the ship. Officially, it was transporting timber from Finland to Algeria. Since the hijacking, various media have suggested the vessel could have been carrying arms or drugs. Russia’s authorities have repeatedly denied the allegations. Maritime expert Mikhail Voitenko was even forced to flee Russia after allegedly receiving threats for making public his suggestions about the cargo. Voitenko was the first to report the seizure of Arctic Sea and suggest the “dangerous nature of its cargo”.